2nd Place $25 Winning Photo – Proactive Maintenance. This was an enclosed patio with multiple cracks in slab. The typical crack height off-set up to 3/16″! We used Crack Weld, 4195 Direct to Concrete Pigmented epoxy and 5073 with a color pigment pack. We used diamabrush on slab after repairing cracks. This was my 1st time doing an enclosed room with this system. It was a challenge with jacuzzi, brick walls and laminate walls. What a difference this coating has made in our new jacuzzi room. It help to hide all the imperfections with the Crack Weld. 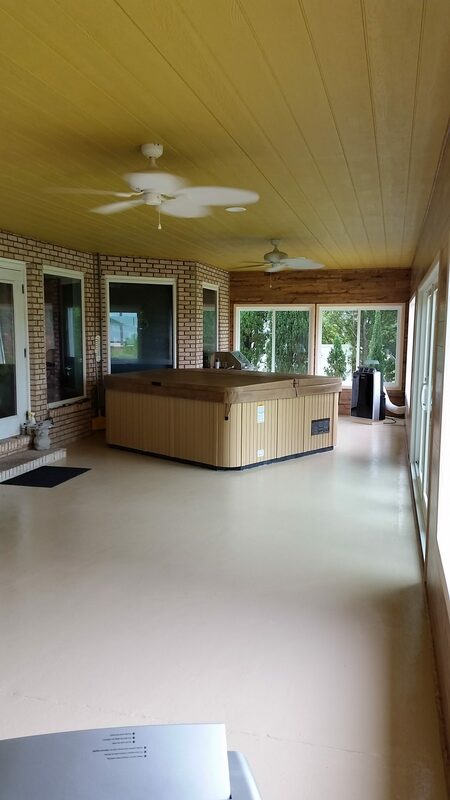 Great job to ProActive Maintenance & Services for making this room and finishing the floor.